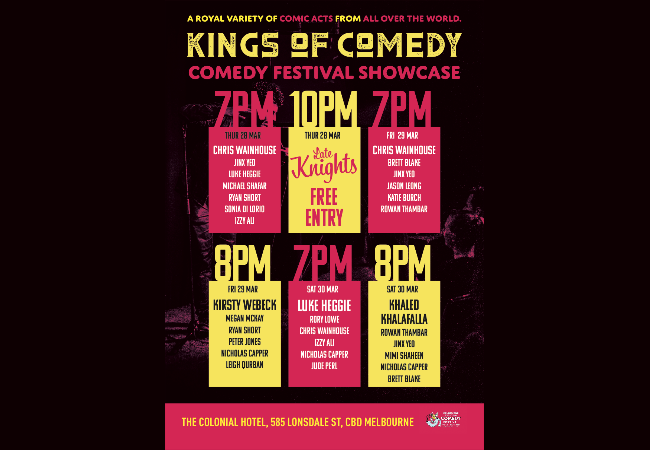 A royal variety of comic acts from all over the world. Thu 28th Mar from 7pm: Chris Wainhouse, Jinx Ywo, Luke Heggie, Michael Shafar, Ryan Short, Sonia Di Lorio and Izzy Ali. Fri 29th Mar from 7pm: Chris Wainhouse, Brett Blake, Jinx Yeo, Jason Leong, Katie Burch and Rowan Thambar. Fri 29th Mar from 8pm: Kirsty Webeck, Megan Mckay, Ryan Short, Peter Jones, Nicholas Capper and Leigh QUrban. Sat 30th Mar from 7pm: Luke Heggie, Rory Lowe, Chris Wainhouse, Izzy Ali, Nicholas Capper and Jude Perl. Sat 30th Mar from 8pm: Khaled Khalafalla, Rowan Thambar, Jinx Yeo, Mimi Shaheen, Nicholas Capper and Brett Blake.